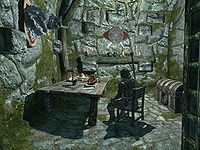 Fort Fellhammer is a fort and iron mine inhabited by bandits, south of Dawnstar. There are two interior zones to the fort, Fort Fellhammer Garrison and Fort Fellhammer Mines, and an exterior. The fort is not too far south of Dawnstar, but is off the paved road which leads to Fort Dunstad to the southwest. 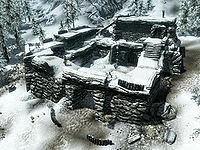 Fort Fellhammer is located off the road that runs south from Dawnstar. After the road passes Red Road Pass it turns east. At the point where it begins to turn westwards a dirt path leads farther east, and to the fort. Around the junction of the dirt path and the main road, there is one blue mountain flower and five snowberry plants, all within a short distance to either side. Along the dirt path are a further five snowberry plants and one more blue mountain flower. Amulet of the Moon: Find the Moon Amulet for Kharjo. Dungeon Delving: Do a favor for Jarl Korir by retrieving the Helm of Winterhold. The fort is guarded by three bandits, who patrol the outer walls. The walls form a circular path from the left of the entrance all the way to the top of the garrison, though there is nothing up there. Part of the right-hand wall has collapsed, allowing for entry that way. There is a smelter beside the stairs to the left of the entrance. The expert-locked door to the mines is on the ground level, and the door to the garrison is on the first level. The garrison is a small area split into two rooms, the main garrison bedroom, and a smaller storage or dining room. There is only one enemy here, though it is the boss of the dungeon. They spend all their time sitting in the chair in the smaller of the two rooms. There are three beds in the main room, and a table, chair, and chest in the smaller room. To the right of the entrance a namira's rot is growing through the stones, and a leather strip, a salt pile, two potions of minor healing and some books on a ledge on the wall to the far left of the entrance. On the table in the small room is a random dagger, some food and several bottles of ale, and behind the door is a basket with two bushels of wheat and a bottle of wine. There are two plaques in the garrison: one weapon plaque opposite the entrance with an iron mace, and one shield plaque in the small room with two crossed iron greatswords and a banded iron shield. Dropping in on him might not be your plan. The mines contain a large amount of iron ore veins, ten in total. There is a rabbit on a wooden block and a cart to the left with four pieces of iron ore, just before the tunnel turns downwards. At the bottom of the slope is a hole with some rotten planks over it. Through the hole a bandit can be seen mining a vein. If you fall through the hole you will need to traverse the mine backwards, though that would decrease the time to exit the mine. Past the hole the path turns right, and heads deeper into the ground. A bandit patrols along here. Just to the right before the corner is a bleeding crown plant, another behind the barrel to the left, and a third to the left after the tunnel has turned. There are two ore veins here, one to the left, and one straight ahead down a ramp. There is an ore vein to the right just before the slope downwards, and a cart at the bottom with three pieces of iron ore. At the next corner there are two veins to the left, and one straight ahead. 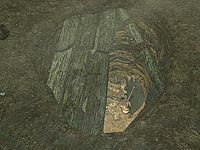 The tunnel turns to the right, and on a table there is a copy of the Heavy Armor skill book Orsinium and the Orcs, a leather helmet, a pickaxe, and a chicken's egg. To the left of the path after the table is another bleeding crown, and a tripwire that makes some boulders fall from the ceiling ahead. Not too far after that is the bandit observable from the hole above, and another bandit is farther along. There is one vein with the first bandit, and three more, two on the left and another on the right by the last bandit. There is a barrel between the two left-hand veins that holds a garnet and an iron dagger. The boss of the dungeon resides in the Garrison, and has the key to the mines. Killing the boss clears the fort, but you may wish to avoid this as it will force a 30-day waiting period for the ore-veins to respawn. If you leave the boss alive, you can visit the mines every ten days for more iron ore. Doing this makes Fort Fellhammer a prolific source of iron ore. Some of the quests that send you here only ask for an item to be retrieved, which can still be done without killing the boss, though the chest is beside the boss in the garrison. This page was last modified on 16 April 2019, at 16:10.